When you make your own sweet treats at home...it spoils you, guys. Like...you got to a cupcake bakery and scoff when you see their cupcakes don't have filling (IF A CUPCAKE ISN'T FILLED IT ISN'T WORTH IT!) Or you look at an ice cream display and see that their "Butterfinger Ice Cream" is vanilla ice cream with Butterfingers-NO! 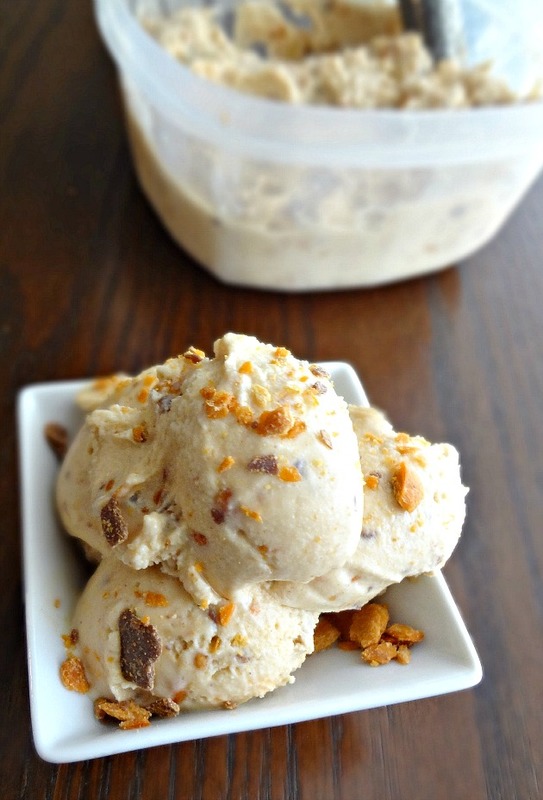 The correct way is to have peanut butter ice cream with Butterfingers. Which is why we have to make these things ourselves. So I did. For you. (...well...and me....and Michael). One super nice thing about this recipe is the fact that it's pretty darn simple to make--you don't cook anything, it doesn't have any eggs in it--you just blend together some half and half, peanut butter, sugar, etc. and then pour it into your ice cream maker! Plus...making this ice cream was an excuse for me to finally try out the new Butterfinger Baking Bits (have you seen those??? They're in the same area as the chocolate chips and such). It's pretty much just a bag of super crushed up Butterfingers...which makes them perfect for using in baking or...ice cream! 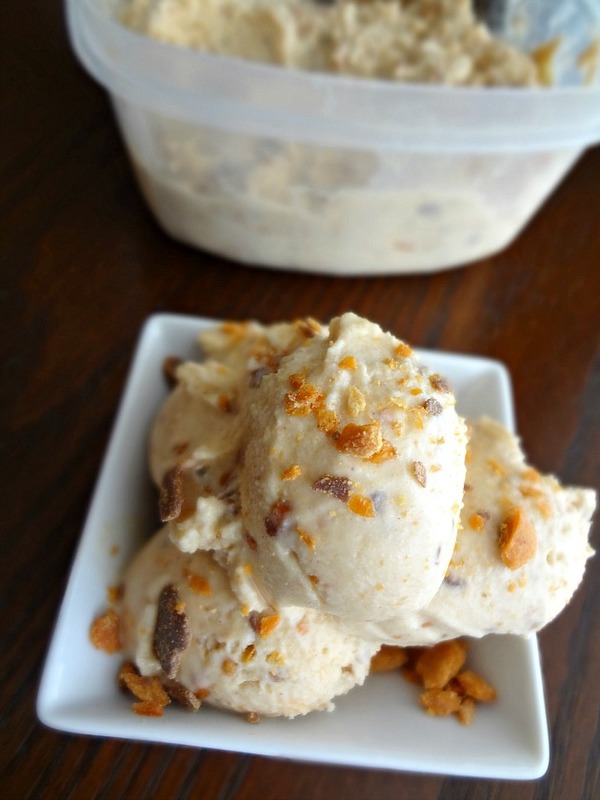 This ice cream turned out PERFECTLY-creamy, silky textured sweet peanut butter ice cream with crunchy Butterfingers in every bite....MMmmm! If I ever opened an ice cream shop, I would serve this and share with the world the way Butterfinger ice cream is supposed to be! Of course...I am sharing the recipe with all of you, so...same thing, no? Give it a try, enjoy it, and then say "Ah Kayle you're totally right! 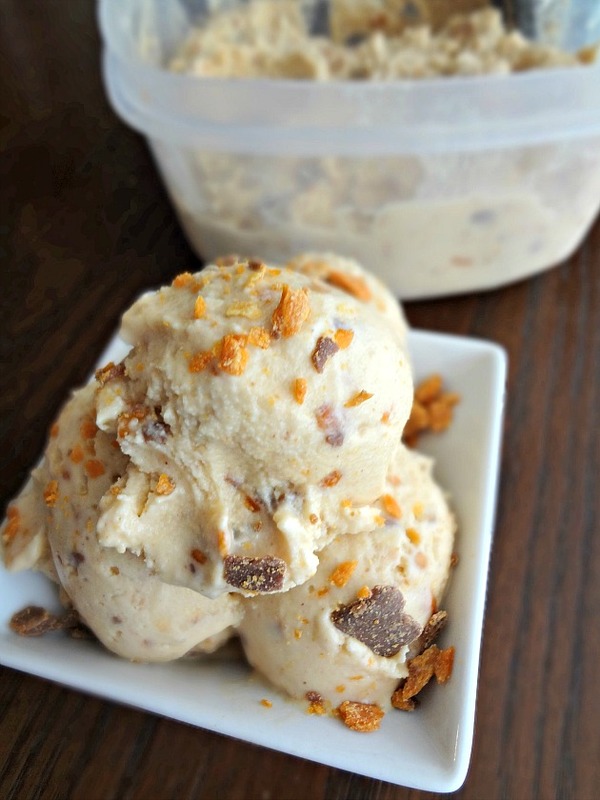 This is the way to make Butterfinger ice cream!" And I'll say, "Aww thank you! OMG riiiiight?? Forreals." ...because I'm a millennial. But can we still be friends? Adapted from The Perfect Scoop by David Lebovitz "Peanut Butter Ice Cream"
Blend together the peanut butter, sugar, half and half, vanilla, and salt in a blender or food processor until smooth. If you're not ready to make the ice cream right away, or if the mixture is not sufficiently cold, chill in the refrigerator. Follow ice cream maker manufacturer's instructions to make ice cream. 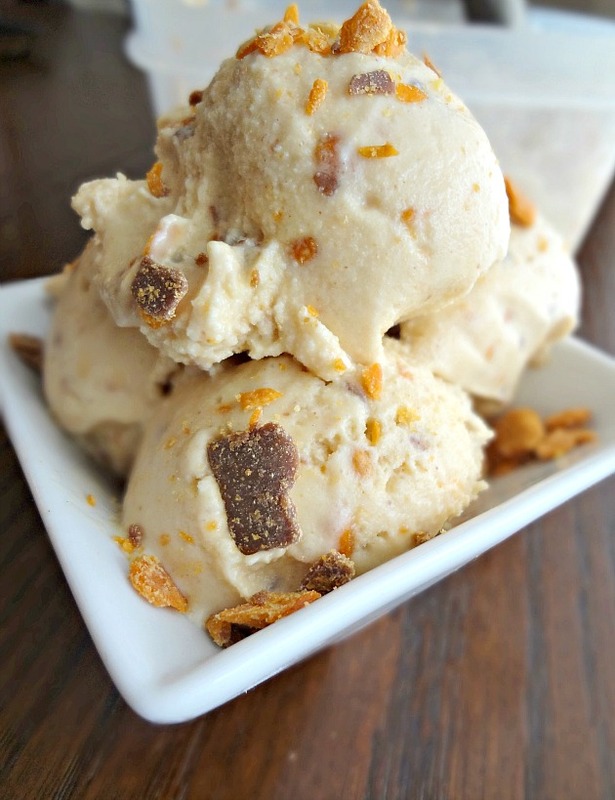 In the final 5 minutes-10 minutes of making the ice cream, add in the Butterfinger bits. Serve ice cream immediately! Or, for a more firm ice cream (or to store leftovers) place in an airtight container and freeze for at least 3 hours, or up to 1 month. I'm obsessed with the texture of this ice cream. SO GOOD!